The Holle Baby Formula isn’t available in the U.S. just yet, but since you can indeed purchase it online regardless of where you’re located, it’s one of the higher rated milk-based baby formulas out there. Made with real milk, the formula is made to mimic the nutrients and benefits from actual breastmilk and might be the closest your child will get, next to the real thing of course. It can be used right from birth, so there’s no waiting to get your baby started on the formula, and right away, it will begin to give your little one the nutrition and vitamins they need for healthy growth and development. Unlike some other formulas which claim to be full of nothing but the nutrition your infant needs, the Holle Baby Formula does not contain any added sugar, wheat, or gluten, so you can be sure that you’ve done everything to choose a gentle enough formula for your baby’s sensitive tummy. The overall ingredients in the formula are 99% organic with added vitamins and minerals, including iron. Like so many other formulas, all you have to do to prepare a bottle is to add warm water to allow the powder to dissolve properly and mix it up. The first stage of the formula can be used for babies from birth up until six months old and then you can adhere to the different Holle Baby Formula stages that come after that for different age ranges. But if you’re looking for a formula that mimics real breast milk and gets the closest it can to the real thing, then this could very well be the right one for your baby. As Holle is a European brand originally, it can be hard to find online. However, I’ve had very good service going with BuyOrganicFormula.com here. It’s made from organic ingredients and with cow’s milk from cows who are raised on biodynamic farms (and organic farming), which should give you peace of mind. The infant milk powder formula has essential fatty acids that come from Maltodextrin, which comes from organic corn and vegetable oils. The formula is as close to breastmilk as possible regarding its vitamins, minerals, and iron. You can use the stage one formula for your baby right from birth and even switch it out with breast milk as needed. It contains no artificial additives or preservatives but still has a long shelf life. The formula is gentle enough on infants’ stomachs to help prevent extra spitting up or constipation. Nutritionally Complete It’s made with mostly organic ingredients and with milk from farms that treat their cows humanely. Your baby can likely go from drinking the Holle Baby Formula to breast milk and back again without noticing too much of a difference. Unlike some other baby formulas, the smell and taste aren’t too overpowering. Since you can only purchase it online if you’re in the U.S., you’ll have to wait a long time for a refund if your baby doesn’t respond well to it. There are different stages of the formula to adhere to, as opposed to having one set formula suitable for babies from birth to 12 months of age. Earth’s Best is known for making organic formula in a variety of different ways. So of course they also have the Earth’s Best Organic Infant Formula that’s also milk-based and made with ingredients that make it taste as close to the real thing as they could get. It contains DHA and ARA for brain and eye development in your baby, Lutein for their eyes, and prebiotic fiber for an active and healthy immune system. Since it contains so many of the nutrients found in breast milk, your baby will be able to get all of the nutrition they need when they can’t or won’t take breast milk itself. You can buy the formula on Amazon or in-store at Target. On Amazon, a 23.2 ounce can of Earth’s Best Organic Infant Formula is $25. Check out the latest price! The formula is gentle enough on your baby’s stomach to help prevent colic and the gas pains that come along with it. There’s very little chance of extra spit-up and reflux once your baby switches to the Earth’s Best option. It contains all of the necessary nutritional benefits that come with breast milk. Your baby can use it even past the one year mark, which is especially beneficial as most toddler formulas have added sugars and this does not. Going back and forth between this formula and breast milk can potentially upset your baby’s stomach. In some cases, it can make for firmer bowel movements, which might make them hard to pass for some infants. Some little ones might get a little gassier after drinking this particular formula. Like the Holle Baby Formula and some others that compare to it, the Similac Organic Non-GMO Infant Formula is made with real milk and contains all that your baby needs or would get from breast milk. With Similac’s OptiGRO mixture of nutrients, your baby is sure to get everything he or she needs, as it includes a blend of DHA, Lutein, and Vitamin E, for your baby’s brain and eye development as well as his or her immune system development. Of course, that’s nothing new with formulas such as these, but this particular option from Similac is comparable to everything that the Holle Baby Formula offers. You can buy it on Amazon or in-store at Walmart and Target. On Amazon, a two-pack of 32 ounce containers of Similac Organic Non- Genetically Modified Infant Formula is about $96. Check out the latest price! The formula is made with a special blend of nutrients specific to those found in breast milk. Overall, it mixes well with water with minimal clumping, if at all, so you can be sure that your baby will have a fully dissolved bottle of formula each time. The smell and taste aren’t overpowering, so it’s likely that your baby will take to it easily, especially if it’s new for them. It might be a little costly for some parents. There may be some residue left over on the inside of the bottle once your baby has finished it. Some babies can become constipated after drinking this particular brand. Overall, the Gerber Good Start Soothe Non-GMO Infant Formula is designed to help ease fussiness gas, excessive crying, and colic, so already it’s a pretty solid choice and definitely comparable to the Holle Baby Formula. Part of what makes it so gentle on the stomach is the Comfort Proteins, which are small proteins that are easier to digest, DHA for brain and eye development, and a carbohydrate blend made with 30% lactose. There are no artificial growth hormones, and the ingredients are all necessary for keeping your baby healthy and promoting healthy overall growth, which is exactly what they need in a formula. You can find it on Amazon and online at Walmart.com and Target.com. On Amazon, a 22.2 ounce container of Gerber Good Start Soothe Non-GMO Infant Formula is $26. Check out the latest price! The gentle ingredients and nutrients are helpful in keeping your baby from growing fussy or uncomfortable with gas. There are generally no issues in getting the formula to dissolve once it’s mixed thoroughly with water. It will likely make your baby’s bowel movements less liquidy, but also less firm or hard. Although it dissolves relatively easily, the formula might also have some initial clumps that need to be broken up before mixing. Milk Allergy: If your child develops a milk protein allergy, which can happen, you’ll need to stop using this particular formula right away. It’s so lightweight that even when mixed with water, the formula may not fill your baby’s tummy as quickly as other formulas. Enfamil has a ton of different gentle formula options, including the Enfamil Premium Gentlease Formula, which is made with easier to digest small proteins that are gentle on your baby’s digestive system. It also contains a hefty amount of DHA and inositol, which helps aid in proper brain development. This means that your child will get all of the nutrients that he or she needs, even if this is a formula and not actual breast milk. Because of all of the nutrients that the formula offers, it’s close to breast milk, which is especially beneficial if your baby can’t get the real thing. You can find it on the manufacturer’s website and Amazon. On Amazon, a 21.5 ounce container of the Enfamil Premium Gentlease Formula is $48. Check out the latest price! The formula has more DHA than some other similar formulas, so it’s even more beneficial than you might think. It can prevent excessive gas and subsequent gas pains in babies. In most cases, it’s relatively easy for babies to transition from breast milk to this formula since it’s so close to the real thing. The mixed formula is a little thicker than others, so it might be more difficult for babies to get it down. The price can sometimes fluctuate randomly and in turn become a little less affordable for some families. Some babies might find the taste to be more bitter than that of other similar milk-based formulas. 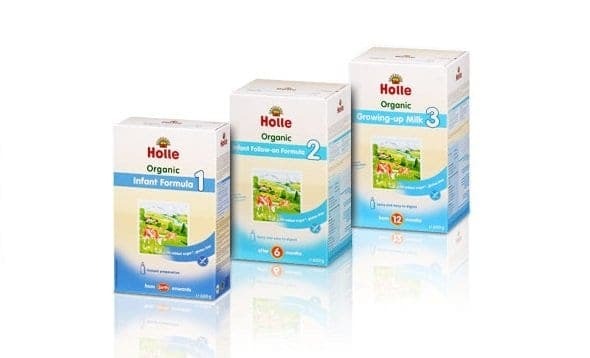 The Holle Baby Formula is easily one of the top milk-based organic formulas out there that mimic the taste and consistency of real breast milk. There’s certainly nothing wrong with switching to formula exclusively, and if you need to have your baby on formula and formula alone, Holle Baby will give him or her what they need. When compared to other similar formulas, the Holle Baby Formula is relatively affordable and offers everything your child needs to aid in their overall development. Other similar milk-based organic formulas offer some of the same nutrients and benefits, but you still can’t ignore all that Holle Baby has to offer, especially if you have a particularly fussy gassy baby on your hands. Of course, it’s not ideal that it’s a product available overseas and that to purchase it from the U.S., it has to be done online only, but it’s a small inconvenience over what might be the perfect formula for your baby. FINDING Holle online is not an easy task. It’s generally not readily available via Amazon and other major formula retailers. However, I’ve compiled a list of verified online suppliers below (and actually tested – all delivered as ordered). BuyOrganicFormula.com. This is my go-to source for ease of use (site is the easiest to navigate) and generally ships quickly with great customer service. Formuland.com: Generally has slightly cheaper prices in bulk, but the site is harder to navigate / sometimes out of stock. OrganicStart.com: Also a good option to check, comparable prices to elsewhere. Takes a bit longer to ship. Baby Jogger City Mini Stroller Review - Is It the One For You? The Full Vermont Organics Baby Formula Review: Is This the Formula You’ll Love?